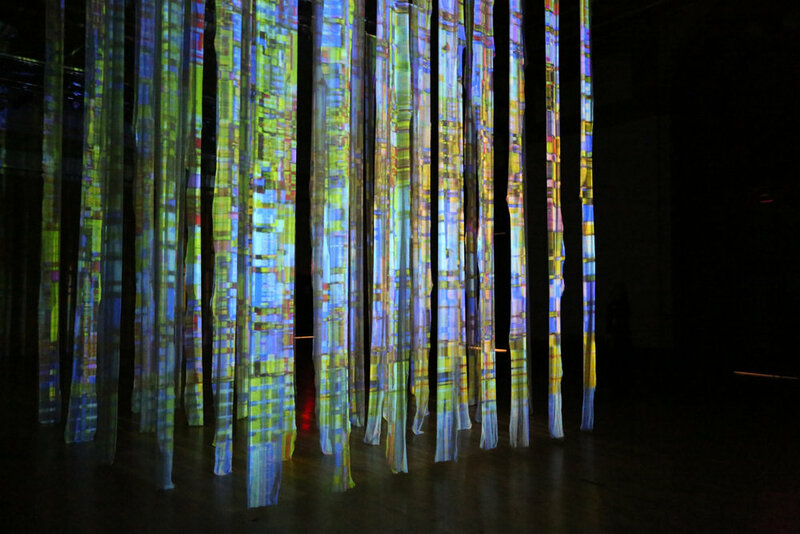 ”Glitche” is an immersive installation inspired by the idea of a glitch, error, or unexpected malfunction in a system. It may be a positive new discovery or a disastrous ending. This interaction is delicate, mysterious, and exciting, and is the force that drives the linear journey of ”Glitche”. Using volumetric sculpture, video projection, and sound, Samo invites the viewer to submerge their senses into this experience. “Glitche” has been installed on two previous occasions, each providing a unique site specific human interaction. The first iteration of the piece at the Massachusetts College of Art & Design was experienced as a private viewing, giving each individual the opportunity to deeply connect with the piece and themselves. The second iteration was implemented on a much larger scale for Illuminus: Nuit Blanche Boston allowing thousands of festival visitors to experience the piece en mass over the course of one evening. The INSTALLATION SPACE presentation of “Glitche” provides an opportunity to experience the artwork in a uniquely quirky and intimate setting. Originally from Great Barrington, Massachusetts, Samo is a Boston based, new media digital artist and designer. Technology serves as the tool he uses to question the boundaries of digital communication and the function of the pixel. His work creates connections between technology, the physical body, and human perception by immersing the viewer in experiences that obscure the line between nirvana and dystopia.